When today is not going well, it is tempting to focus on tomorrow as a blank slate with all the possibilities that newness provides. It is true that tomorrow will be a brand-new day, but we do not have to wait until tomorrow to start fresh. We can start fresh at any moment, clearing our energy field of any negativity that has accumulated, and call this very moment the beginning of our brand-new day. There is something about the sunrise and the first few hours of the morning that make us feel cleansed and rejuvenated, ready to move forward enthusiastically. As the day wears on, we lose some of this dynamic energy and the inspiration it provides. This may be why we look forward to tomorrow as providing the possibility of renewal. Many traditions consider the light of the rising sun to be particularly divine in its origins; this is why so many people in the world face east when performing ritual. We too can cultivate that rising sun energy inside ourselves, carrying it with us to light our way through any time of day or night, drawing on its power to awaken and renew our spirits. One simple way to do this is to carry an image or a photograph of the rising sun with us in our wallet or purse. We can also post this image on our wall at work or at home, or have it as our screensaver on our computer. When we feel the need to start fresh, we can take a moment to gaze at the image, allowing its light to enter into our hearts. As we do this, we might say out loud or quietly to ourselves, I am ready to let go of the past and start anew. We might visualize anything we want to release leaving us as we exhale, and as we inhale, we can take in the fresh energy of the eastern sun, allowing it to light the way to a brand-new day. This drawing has been in my wallet for months. And it is My Inner Sunshine. This was sent to me by the kind people at Daily Om. I get emails from them reguarly and LOVE the inspiration they give me. I began writing something else for this post at 6am this morning whilst drinking my BIG GREEN JUICE, but deleted it all after reading what you've just read above. It sums up everything I've been feeling the past couple of weeks. I wrote here not long ago about where I feel I am and some difficulties I've been having, and I suppose I'm still a little stuck in a few places. The words sent to my inbox were exactly what I needed. And I hope they mean something to all of you as well. Thank you for sharing these words - a great reminder!!! And how true that we can bring in the Light at any time, day or night. You know me, and how much I love the Light, sunSHINE and Yellow. Enjoy the SUNSHINE!!! Thank you for posting this. 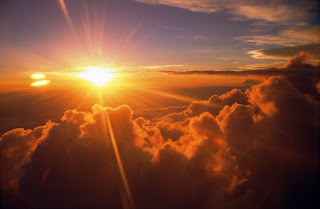 I was litttle depressed and was searching for shiny sun rise pictures via web surfing, found this beautiful sun rise pictures and also wonderful cheering-up, mind refreshing inspirationg words. I like your sun. I used to be a person more like 'to follow the sun', Now I learned that Ican carry my sun!